Lotus Club, el mejor ambiente con música en directo. Lotus club: Dringking, dancing and life music. The Lotus Club is a combination of an elegant place, designed by Antoine Van Doorme, of a professional team that embodies the fine culinary art and mastery of cuisine, prepared by a recognised chef. Since its opening in 2009, the Lotus club Marrakech quickly established itself as a place where the best Marrakchi nights reside. Located in the heart of Hivernage district, Lotus Club Marrakech restaurant offers two bars chics and cozy, and also a no-smoking area where you can dinner and discuss quietly, ideal to savor our different colourful & original cocktails while leaving tempted by our Tapas proposal. Furthermore, enjoy every evenings, unpublished entertainment shows, with dance shows of the Artistic Revue OhLaLa, Mood’s live guitar shows, the best mixes of our resident DJ, without forgetting the various international artists that perform each month at the Lotus Club Marrakech. 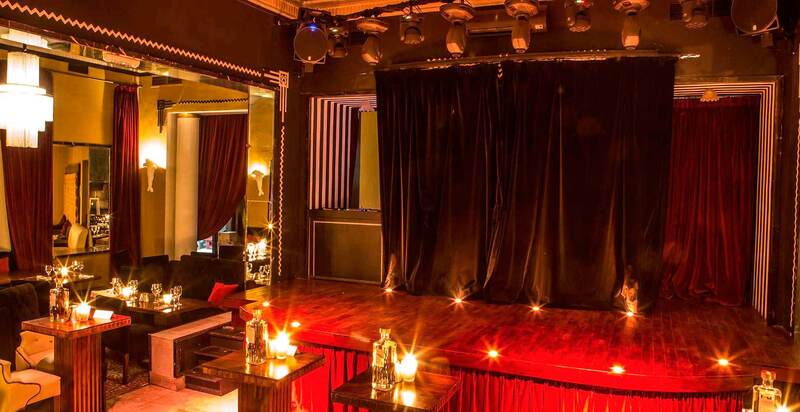 Lotus Club in Marrakech offers show and lifemusic. The entertainment was great, (several dance shows) the ambience and quality of the place is amongst the best in Marrakesh and I would highly recommend it to all visitors. “Lotus club was an exciting package, quality of spectacle, the range of food, the sensual ambience, the luxurious lounge, and lovely hostesses. Khaula; my experience of the club would have been incomplete without your charming hospitality. Riad Aguaviva suggestionn: Lotus Club it´s located in front to Le Comptoir Darna. A good place for one drink anter dinner “mechoui” in Le Comptoir Darna.